CSTR is an acronym for Continuous flow Stirred Tank Reactor. Such a setup makes it possible to keep (bio)chemical reactions running forever. My setup is shown below. It consists of a stirred 1-cm cuvette, where the constant inflows of glucose, cyanide and yeast-cell suspension is mixed. 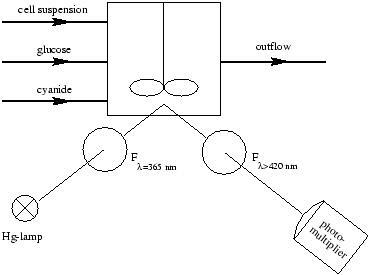 The volume in the reactor is kept constant by the outflow. During the experiment, the yeast cells are stirred and kept cold.